Gildings Auctioneers conduct valuations for Art, Antiques, and Specialist auctions throughout Northampton and Northamptonshire. We have specialist valuers for jewellery, watches, silver, toys, model railways, memorabilia, 20th century art and design, medals and militaria, furniture, and paintings, as well as general valuers to help with larger house clearances. We host fortnightly auctions every other Tuesday, and valuation days every Friday. If attending our spacious auction room located in Market Harborough, Northampton is only a short journey away by car or public transport. 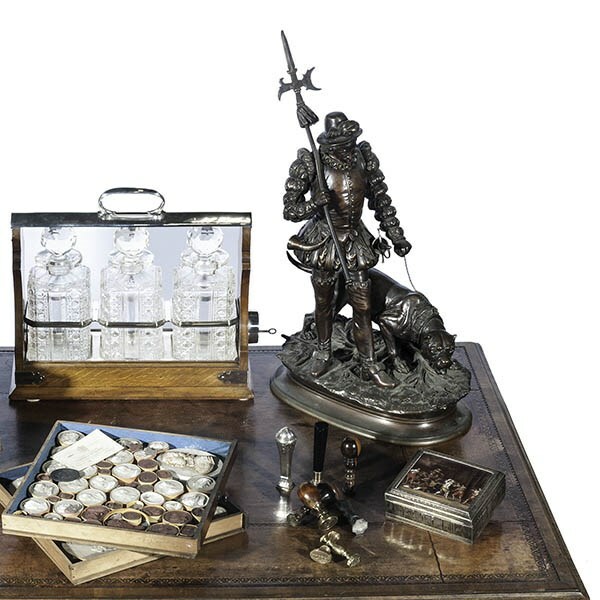 Our fortnightly Antiques and Collectors sales feature everything you might find in your home! We also hold specialist auctions throughout the year for Jewellery and Watches; Toys, Memorabilia, and Model Railways; and 20th Century Decorative Art and Design; and three Fine Art and Antique auctions highlighting the best antiques found throughout Northampton and beyond. View our Upcoming Auctions calendar for further details or sign up to our newsletter. Bidding has never been easier if you cannot attend in person – you can bid via telephone or the internet through our Live Bidding service. Our Team are regularly visiting locations throughout Northampton and Northamptonshire conducting valuations for a range of purposes. We offer free, confidential, and non-obligatory auction valuations, as well as professional valuations for insurance and probate submission. For auction valuation, provisional guidance can be given from images submitted through our online Valuations pages. We can then confirm auction estimates once we had seen items in person, should you wish to sell the item. Appointments can be made throughout the week either at our saleroom or in your home for larger items or collections. Alternatively you could come to our drop-in Valuation Days every Friday to see one of our Valuations team. Jewellery valuations do require our in-house to inspect items in person due to the variety in stones and materials we may encounter. Specialist equipment may be needed to inspect certain gem stones, or to confirm metal clarity. This is also true for silver and watch valuations. A dedicated appointment with our specialist at our saleroom can ensure we offer accurate guidance on values for auction. We understand parting with items of this nature can be an emotional decision, as well as a financial one, just as investing in a new piece can be a very personal decision. With over 30 years of experience in the jewellery trade, our Team are sympathetic to your needs. See our Jewellery Department pages for more details. Gildings auction house is situated on the Northamptonshire border. We are located in picturesque Market Harborough near the train station and just a short walk from the High Street, making us very accessible by car, bus, or train.